Hello Family and Friends! Thank you for visiting our journal! We have so enjoyed keeping up with many friends and relatives through your family blogs. If any of you have started a blog that we don�t know about, please tell us!!! We promise we won�t make fun of your family if you don�t make fun of ours� Also, thanks to those of you who have taken the time to sign our guestbook � we love to hear from you! This past month has been interesting with all the TONS of snow we have been getting! School has been canceled numerous times because of snow or freezing temperatures. Just when we all started thinking that Rexburg winters were getting milder�this year happened. I feel like I have gone back in time to my childhood. Click on January to see pictures of snow, a hymn Richard composed, and our silly kids. 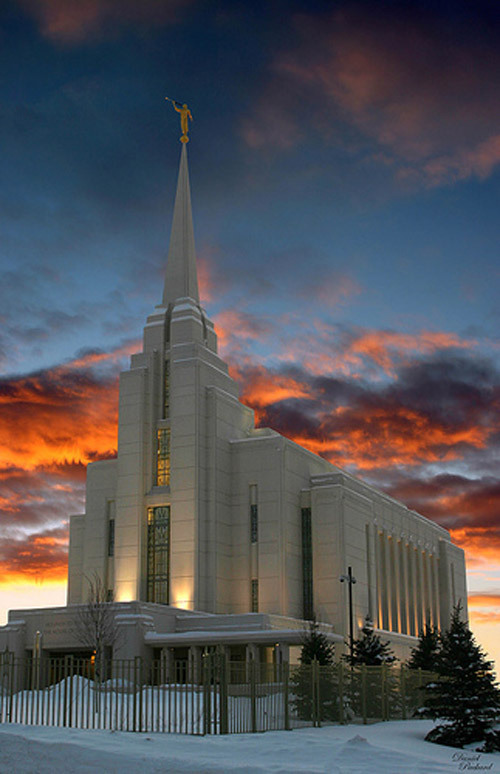 Below is a picture of our beautiful Rexburg temple! It will be dedicated on Febraury 10th. We are so blessed to have a temple just a few blocks away! In January, I (KaraLyn) had the opportunity of ushering in the Celestial room during the open house. There is such a feeling of peace in the House of the Lord. The work that goes on there is wonderful and truly the work of the Lord. February 24, 2008 from "Alison Ferguson"
We miss you guys! Once we get all settled in, we'll have you down for a weekend. We counted 42 deer in our backyard one day -- the kids will love it! We hope to see you all soon! February 16, 2008 from "Alyse Burt"
Thanks for the Valentine, it was so cute! 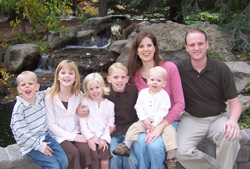 Hopefully we come to visit soon, the kids ask nearly everyday when we are going to Rexburg again. Tiffany Huff told me they are planning a Smith family reunion on June 14th, I hope you guys can come down for that! February 12, 2008 from "maren layton"
February 6, 2008 from "Kelli Marshall"
What a gorgeous picture!!!!! i can't wait to come visit and see the temple in person! February 4, 2008 from "Beck Hill"
Richard and KaraLyn, I just love your journal. You are both so clever and creative. I really enjoy looking at your pics and reading your entries. But, I'm wondering... are those musical selections really Thomas' favs or is that wishful thinking? Keep up the good work! The hymn is beautiful! Thanks for sharing it with us. I miss our association we had for that year. I'm glad you sent this to me. Now that I know about your blog I can keep up with what is going on in your family. I will be starting at the temple as an ordinace worker a couple days of the week and if the weather keeps up I will be spending the rest of the time shoveling snow!! We purchased a cabin up near Henry's Lake and so our family has been having a wonderful time pretending we are real outdoorsmen. Your pictures just make me miss you guys even more then I already do! I loved seeing Richard so excited about his rocket and the hymn was beautiful. I actually miss the snow...we don't get any here and I'm totally ready to come back and see the temple and play in the mounds of snow. Your journal is great and I love seeing everyone happy! Give them all hugs for me. You couldn't have picked a better picture of the month. We're all excited for the Dedication. I believe the Temple brought the snow. Richard, the Hymn is beautiful! You are so talented. Now, if I can just get you to join the chior! Congratulations on winning the space derby Thomas (and Richard). It brought back all those cherished memories of sewing on all those badges. By the time Kevin became a scout I used iron-on sticky stuff to put them all on. They stayed on, but then I never washed it either. Love the picture of James, what a doll! Also, what a beautiful hymn! I'm very impressed! If you were wondering, we are super jealous about the temple (and the fact that you got to be a part of the open house!). Can't wait to come up and see it when we move back, although it looks like we should come in the summer! What a beautiful hymn! I'm not suprised just really impressed. Thanks for sharing it with us.